The process of obtaining a Nigerian visa has been likened to a “camel passing through the eye of a needle.” To visit, foreigners need to successfully navigate a maze of paperwork both before and after they get into the country. But that’s set to change, eventually. As part of a 60-day plan to improve Nigeria’s business climate, the Nigerian Immigration Service (NIS) “has reviewed the requirements for Nigerian visas to make them more customer friendly.” To make entry smoother, the NIS will harmonize airport immigration forms to reduce the stress of paperwork for visitors. Visas on arrival will also be made available to high net-worth investors coming for urgent business and to visitors from countries without Nigerian consulates. In addition, to make it easier for foreigners to obtain residence permits, NIS has opened 28 additional offices across the country. 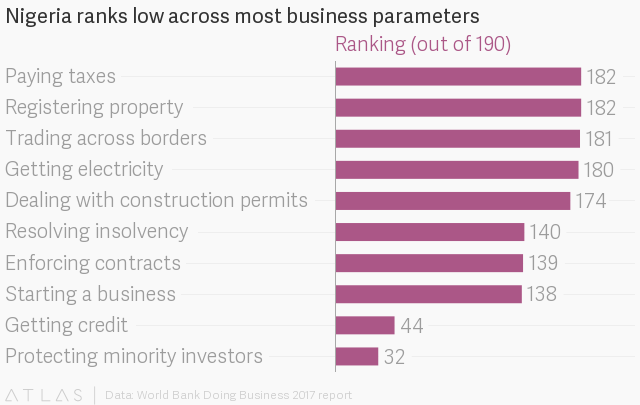 With Nigeria’s lowly rankings on World Bank’s Doing Business report stalled out in recent years, Nigeria’s government has made business reforms a priority and set up a presidential council to implement them. Of 10 areas measured by the World Bank, Nigeria ranked in the bottom half in eight of them. Not all the new rules are focused on foreigners, as in the case of NIS streamlining the process of reissuing passports for people who lose them or change their names after marriage. In the past, these citizens needed to travel to Abuja, Nigeria’s capital city, to get their new travel documents. Under the new rules, state immigration offices and foreign missions are now able to re-issue passports.